musical instruments can be beautiful products. From time to time I get asked to photograph musical instruments. If you know how to play them, they can make beautiful music. Musical instruments are often interesting products. Many people are seduced into buying a shiny new guitar and then try to learn how to play them. It is definitely a useful skill for get togethers with friends. With this one you would need an amplifier to get a decent sound out of it. To play a guitar well you have to practice and practise. I think this is an accoustic guitar. I wouldn’t know. The only instrument we have at home is a bugle which gets noisily blown occassionally to annoy the neighbours. 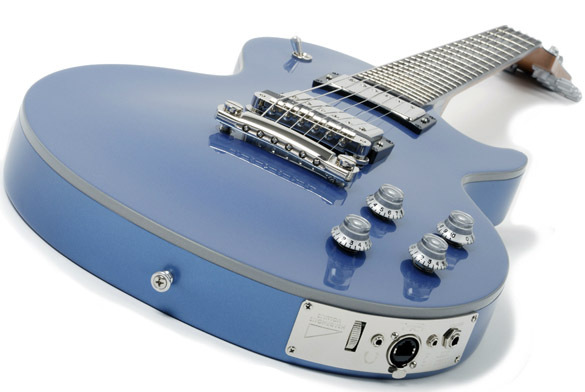 This is a Gibson guitar in a nice shade of light blue. Cool!